Not sure what the best color for your diamond engagement ring is? We recommend H as a safe bet. H is the most popular color choice in the American diamond market. It offers a good balance of price while still providing the icy-white nature that a lot of people prefer in their diamonds (not talking about fancy colored diamonds, as that's a whole other topic). On the scale between D through K (the usual range for engagement ring diamonds), H is commonly thought of as the tipping point between colorless diamonds and diamonds with a slightly noticeable yellow tint. Most people can hardly see the difference at all - but you will notice a large price jump between each color grade. In this article, we'll show you why H diamonds offer the best value for your money, using real examples from online diamond retailer James Allen. D, E, F (Colorless): These diamonds are colorless and super rare. They also come at a much higher price. If you enjoy very icy white diamonds, you may not mind paying the premium. G, H, I, J (Near Colorless): A slight undertone of yellow can be detected by an expert gemologist. However, the slight tint in G and H diamonds is virtually undetected by the average person. At I and J, the tint becomes a bit more apparent when compared to a diamond of higher color grade. But they offer great value, especially if you prefer a warmer look to your jewelry. For this color grouping, check out our guides for G,H, I and J.
K, L, M (Faint): A yellow color is more noticeable at this point, even without having to compare with a higher color grade diamond. Usually, online retailers don't sell diamonds for engagement rings less than a K.
N-R (Very Light): Very noticeable yellow tint and looks like a poor quality diamond, even to an untrained eye. S-Z (Light): Color at this range can start to have a brown tint. Needless to say, there is very little demand for these. H is somewhere in the middle of the "near colorless" range, but that doesn't mean you'll see the slight yellow tint. It is VERY difficult for the human eye to tell color just a couple of grades apart. To illustrate, take a look at the examples below. 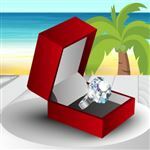 Where is the Best Place to Buy H Diamond Engagement Ring? If you're considering a H-diamond engagement ring, you must check out reputable online retailers like Blue Nile and James Allen. For simplicity's sake, we will be looking at diamonds graded with a color of F (colorless), H, and J (bottom of near-colorless) for these comparisons. 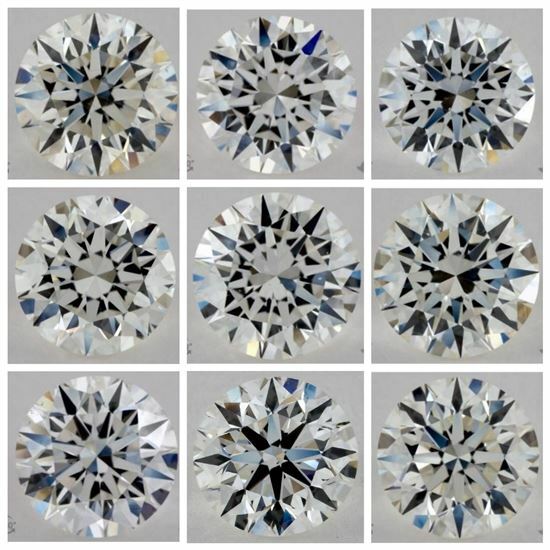 All are 1-carat with an excellent cut. I don't know about you, but to me, they are not very easily distinguishable from each other in the face-up view, even under extreme magnification. But don't worry, because when mounted on a ring, people will only be admiring it face-up. And remember - color doesn't determine how sparkly and shiny the ring is. The cut of the diamond (proportion, symmetry, and polish) will make the biggest impact on how bright, and therefore "white," the diamond appears. An ideal cut diamond will reflect light in such a way that it masks slight color. A diamond that is lower in color grade but is well-cut will appear more brilliant than a poorly cut, colorless diamond. So we always recommend putting your money towards a better cut than a higher color grade. There are 2 H diamonds hidden in this grid. The rest of the diamonds represent color grades D-K (colorless to faint yellow). Can you spot the colorless ones and can you pick out the two H diamonds? Or take a look at diamonds yourself with James Allen' 360° video. So what does an H diamond look like mounted on a ring? The H diamond (left) looks a little warmer when compared side by side (don't mind the yellow spots around the edges, that's due to external factors). But in reality, the casual observer would not be able to tell that this is a "near colorless" diamond, especially if it's not sitting right next to a colorless diamond. It will appear white face-up and will look completely fine set in any metal color. The J colored diamond (right) is noticeably more yellow when set on a white gold ring. This is why H-colored diamonds provide a good balance-only 2 grades down from colorless (which is difficult for the human eye to detect) and 2 grades up from a yellow tint that may be more easily noticed. Tip: Our examples are of round diamonds, but the diamond shape you choose will also affect how much color is revealed. Brilliant cuts (like round) do a great job of reflecting light and masking slight color, while step cuts (like emerald and asscher) are known for their depths and therefore show color more easily. This is also why we love H, because it's a safe choice for just about all shapes. The difference in color is tiny, but the difference in price is huge as you move up and down the color grading. D, E, and F diamonds are essentially colorless, and because of their rarity, they're priced at a premium. H diamonds look practically colorless, but the drop in price is significant. Looking at our F, H, J trio of diamonds above, here are the price differences with all else being equal (1-carat, excellent cut, VS2 clarity). The H-colored diamond is almost $1,000 less than the F-colored diamond. You decide if that extra grand is worth it just to have "colorless" on a piece of paper. Going down 2 more grades to J is an even more significant drop in price, but the reason we don't recommend J for white gold/platinum bands is that you may be able to see the slight yellow tint. Tip: The setting also plays a big role in how white the diamond appears. A diamond will naturally pick up the color of its surroundings, so an H diamond set in a yellow gold or rose gold band will take on a warmer tint. If you're planning on purchasing a yellow or rose gold band, there is no need to go for an H-colored diamond, as it'll appear more yellow anyway. A J (or even K) would match the setting nicely and could look gorgeous. H diamonds offer a great value in terms of the price and beauty of the diamond. If you are really concerned about a yellow tint or if you're purchasing from a website without photos, H is a safe choice. We hate to make guarantees, but we're pretty sure that the average person will not be able to detect a hint of color. Are you surprised? How many did you get right? Leave a comment about Why H Diamond Color is Good Enough for the Best Value?